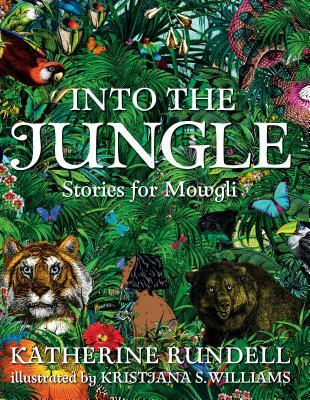 This wise and witty companion to Rudyard Kipling’s 1894 classic is likewise a series of connected stories about the man-cub Mowgli and his adventures among the animals in the Indian jungle. It includes all the original favorites like Baloo and Bagheera and gives female characters, like Mother Wolf, a more prominent role in Mowgli’s upbringing. The timely theme of the possibility of understanding and empathy across species, cultures, and genders will resonate with contemporary readers. Katherine Rundell was born in Kent, England, and raised in Zimbabwe. She is a fellow at All Souls College, Oxford, and the author of numerous award-winning books for children, most recently The Explorer, winner of the 2017 Costa Children’s Book Award. She has been short-listed for the Carnegie Medal and won the Boston Globe–Horn Book Award. Katherine Rundell lives in Oxford, England. Icelandic-born Kristjana S. Williams is an award-winning illustrator and designer whose commissions include art for the Rio Olympic Games and The Wonder Garden, written by Jenny Broom. It's impossible not to imagine a room full of younger kids transfixed by the hypnotic action. If Rundell's storytelling doesn't do it for them, the illustrations surely will. Williams's richly drawn jungle scapes are equal parts gorgeous and haunting, an irresistible combination. [The] follow-up makes for an engaging read, as Mowgli develops from a rather self-centered child to one who cares about his extended jungle family. Rundell's values-based narrative and Williams' earthy images reinforce the importance of different species' understanding one another and working together. Rundell emphasizes unity in diversity in this 21st-century companion to a complicated 19th-century classic.